The Internally Transportable Vehicle (ITV) will provide a range of V-22 internally transportable vehicles to fill light strike and utility roles in support of the STOM. The Internally Transportable Vehicle (ITV), also being developed in conjunction with USSOCOM, will replace our current Interim Fast Attack Vehicles (IFAVs), providing critical ground mobility to vertically lifted elements of the MAGTF. Marine Corps small units, raid forces, and ground reconnaissance teams have long recognized the need for rapid, extended range, deep maneuver in ground mobility assets coupled with remote firepower that will allow secure observation, movement and violence of action in the objective area. As the battlefield expands and the Navy/Marine Corps team operates more extensively in the littoral environment, these mobility assets will require vertical transport to the objective areas. This will necessitate smaller, lighter, and more capable vehicles that must be internally transportable in the MV-22 to support Operational Maneuver From the Sea (OMFTS). Award of a single, production contract. The current fleet of light tactical vehicles, the aging M151-A2 Fast Attack Vehicle and the High Mobility Multi-Purpose Wheeled Vehicle (HMMWV), are approaching the end of service life. The HMMWV remanufacture program will extend the service life another 7-10 years but the vehicle will remain incapable of internal transport in the MV-22. The Reconnaissance, Surveillance, and Targeting Vehicle (RST-V) was being developed as an advanced technology demonstrator, incorporating advanced power/propulsion, mobility, and survivability technologies to address this deficiency. An extensive amount of testing was undertaken and accomplished in anticipation of a Milestone I decision to proceed with development and fielding of the the Light Strike Vehicle (LSV)/ Internally Transportable Vehicle (ITV) Program. 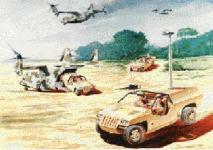 The efforts conducted between 1993 and 1998 included early safety testing, developmental and comparison testing of an LSV surrogate with baseline Fast Attack Vehicles (FAVs) and the High Mobility Multipurpose Wheeled Vehicle (HMMWV), as well as continuing developmental and demonstration testing that was conducted by the Amphibious Warfare Technology (AWT) Directorate, Marine Corps Systems Command. The Marine Corps Systems Command redefined its acquisition strategy to take advantage of the maturity of solutions available in the marketplace. This new approach will focus on non-developmental solutions, and leverage research and development efforts that have been accomplished by the Government to date. MARCORSYSCOM intends to reduce the structure of the formal acquisition approach in favor of a non-developmental approach that will also leverage "value added" technologies to achieve immediate and long term goals. The ITV replaces the Fast Attack Vehicle (FAV) and some ground vehicles currently employed throughout the Marine Air Ground Task Force (MAGTF). The ITV will provide a deployed MAGTF and Marine Expeditionary Unit-Special Operations Capable (MEU-SOC) with a ground vehicle that is internally transportable in all medium and heavy lift rotary wing aircraft. A mission need statement established the need for a Special Operations Capable Vehicle (SOCV) in response to a validated Fleet Marine Force (FMF) requirement. The SOCV was subsequently renamed the Light Strike Vehicle (LSV) and the Joint operational requirements document with U.S. Special Operations Command was approved. Later, there was a mission need statement for the family of Internally Transportable Light Tactical Vehicles (IT-LTV). This program, as follow-on to the LSV, was for a larger quantity of aircraft transportable ground vehicles. Then, in April 1999, the Marine Corps Combat Development Command (MCCDC) combined LSV and IT-LTV and renamed the program the ITV. Typically, helicopters land troops, equipment and weapons, which allows Marines to complete assigned missions. A key driver for the ITV is the V-22, a new helicopter that provides a new capability to the Marine Corps. The V-22 is a high-speed helicopter that will carry troops and equipment from ship to shore. The ITV's chief requirement is that it be small enough to fit inside of the V-22, to meet the purposes of expeditionary forces. Generally, the cargo space in helicopters is limited. For example, V-22 cargo space is about 68 inches wide, 66 inches high and 200 inches long. Therefore, fitting inside the V-22, or any helicopter, is a challenge. Currently, the Marine Corps relies on old WWII vintage Jeeps for ground transportation because they meet the size requirements. Other existing systems, including the FAV and the High Mobility Multi-Purpose Wheeled Vehicle (HMMWV - also known as the HUMVEE), affect the ability of the AMGTF to accomplish assigned missions. The FAV is a narrow vehicle with a high center of gravity, which is unstable, not supportable since replacement parts are not available, uses gasoline, cannot traverse the same variety of terrain as the HMMWV, and has a limited operational range of about 200 kilometers (125 miles). The HMMWV cannot be internally transported in current or projected Marine Corps rotary wing aircraft. USSOCOM has examined a number of alternatives, including the Ranger Special Operations Vehicle, the Medical Special Operations Vehicle, the Shark, the Camel and others, but these would not fit in the restricted size of the V-22 cargo compartment, either. Originally, the ITV program sought to produce a sufficient quantity of vehicles to replace the old Jeeps, from 100 to 200. Then, the Marine Corps started examining future missions and realized thousands of new vehicles needed to be produced. The ITV is a brand new vehicle designed by a new way of thinking. With the ITV, there is a specific set of missions and a smaller quantity than the HMMWV. "Yes, we are buying 2,000 to 3,000 vehicles, but we have well-defined missions for those vehicles," said Mike Gallagher, who is the ITV Program Manager at the Marine Corps Systems Command. "This is really the ground platform that complements the V-22 helicopter to enable the Marines Special Operations Forces to accomplish their goals." The ITV will resemble a HMMWV, but will be much narrower to accommodate the V-22 cargo hold. Like the current family of HMMWV, the ITV will be a multi-purpose vehicle. Built around the same common chassis, there are about one dozen different variants of the HMMWV. The same strategy will be used with the ITV. A basic vehicle will be built and modified for future missions and requirements. The ITV can be tailored for missions it needs to accomplish. Potential requirements include command and control, transporting personnel, weapons and litters when it is used as an ambulance carrier. It can also be used as a general utility vehicle. The "fly off/demonstration" contract phase will result in extensive involvement of Marine Corps personnel and US Army special operations forces to assess mission suitability, supportability concepts (e.g., training requirements and logistics), and performance objectives. Throughout this evaluation period, feedback will be provided to the Contractors to support final vehicle configuration. At the conclusion of this phase, an evaluation report will be issued to the respective Contractors based upon operational and technical assessments of their vehicles. A final production solicitation will be issued at the completion of this phase to allow Offerors to submit revised pricing consistent with their final vehicle configuration and supportability approach. A single contract will be awarded for production of twenty-five hundred (2500) to three thousand (3000) base cargo vehicles to support the acquisition objective. The Government intended to award of a Firm Fixed Price (FFP) Indefinite Delivery/Indefinite Quantity (ID/IQ) (minimum order 373 vehicles/maximum order 4,000 vehicles) contract in July 2000. Approximately ten (10)pre-production configured vehicles shall be delivered within twelve (12) months of contract award for verification and safety certification testing. Initial Operational Test and Evaluation will take place within 24 months after contract award. Production of the baseline configuration would have commenced after successful completion of Initial Operational Test and Evaluation (IOT&E). To address this operational requirement, the ITV program was initiated in 1999 as a joint program with the U.S. Special Operations Command (USSOCOM). The ITV requirement, as described in the Joint Operational Requirements Document (JORD), is for a light tactical vehicle small enough to fit inside the MV-22. The initial acquisition strategy for the ITV focused on Non Developmental Item (NDI) alternatives. In 2000, the Marine Corps selected two commercial vehicles as candidates for the ITV. During assessments of these candidate vehicles in the summer of 2001, the vehicles generally met the operational requirement. However, their operational suitability was marginal with respect to loading in and unloading from the MV-22. In view of these results and with the Initial Operational Capability (IOC) of the Osprey postponed, the planned NDI procurement was cancelled in March 2002. The ITV program office conducted a requirements review of the JORD, as well as studies, to identify potential cost, risk, schedule, and performance tradeoffs. The only performance parameters not subject to tradeoff are the ability to transport the vehicle internally in the MV-22 and the requirement to operate the vehicle on diesel fuel. The vehicle must operate on diesel fuel, be able to carry the M-2 .50 cal, the MK-19 40 mm, or the M240G medium machine gun, and be internally transportable in MV-22 aircraft. Firms able to meet this requirement are invited to submit a statement of capabilities and product literature to include current GSA information (if applicable) and price schedules or cost estimates. A cornerstone of Operational Maneuver From the Sea (OMFTS) is the insertion of vertical assault elements against deep inland objectives with the MV-22. The infantry units comprising the vertical assault element must employ their medium and heavy machine guns and automatic grenade launchers immediately after landing. These weapons systems are too heavy to be man-packed except over very short distances. Consequently, there is an operational requirement for a vehicle, internally transportable in the MV-22, to carry these weapons. Special operations forces, Marine Expeditionary Units (Special Operations Capable) (MEU(SOC)s), and reconnaissance units, inserted by MV/CV-22s, will also need mobility assets to support a wide variety of missions. The program office anticipated that industry responses will range from all terrain/light utility vehicles to sports utility vehicles to 4 wheel drive pickup trucks to existing military tactical vehicles. 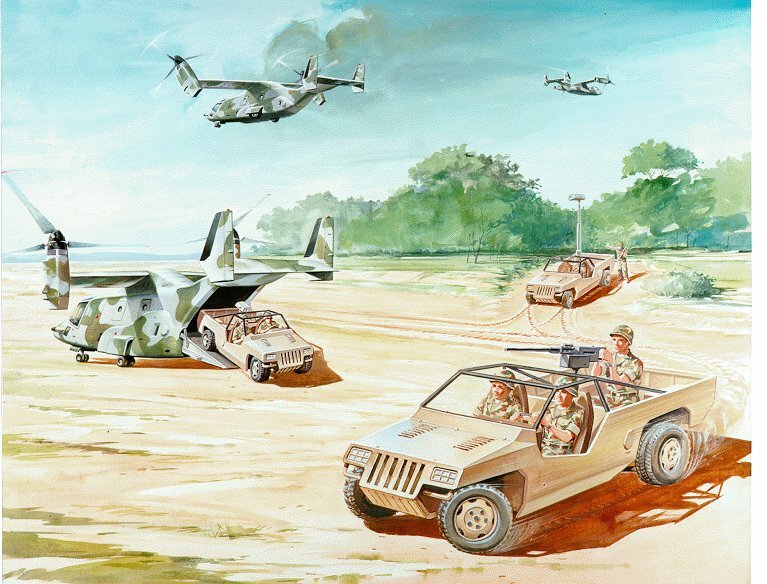 Initially, the Marine Corps used the M-151 jeep as a fast attack vehicle to satisfy the MEU(SOC) requirement for a weapons platform capable of internal transport by helicopter. The Marine Corps has replaced these obsolete M-151s with an interim fast attack vehicle (IFAV). Firms wre encouraged to address the following, as a minimum: 1. Physical characteristics demonstrating compatibility with the MV-22 (The Interface Control Document for integrating a Ground Vehicle into the V-22 Osprey Tiltrotor Aircraft is available upon request). 2. Payload capability and the capability to mount weapons (M240G, M-2 .50 cal, and MK-19). 3. Engine power output. 4. Electrical system. 5. Performance specifications addressing maximum speed, primary and alternate fuels, fuel capacity, range, cross country mobility, ground clearance, obstacle/slope negotiation, turning circle, and fording capability. 6. Towing capacity (including estimate of mobility impact) 7. Ground clearance. 8. Rough order of magnitude price estimates for vehicles and support package (listed separately). 9. Rough estimate of schedule for production preparation, production, and delivery of 100, 300, and 500 vehicles. 10. Maximum production rate capability. Firms able to meet this requirement were invited to submit a statement of capabilities and product literature to include current GSA information (if applicable) and price schedules. On November 10, 2004 General Dynamics Ordnance and Tactical Systems, St. Petersburg, Fla., is being awarded an $18,295,337 firm-fixed-price, cost-plus-award-fee, indefinite-delivery/indefinite-quantity contract for both the Expeditionary Fire Support System (EFSS) and Internally Transportable Vehicle (ITV). This contract is for two separate programs produced by General Dynamics under one contract. The basic award is for program management & engineering, logistics support, the EFSS, technical publications, ammunition to support developmental testing, and the ITV (with ITV integrated management plan, system engineering management plan, system engineering documentation, logistics management, assessment training, and contractor support during assessment). This contract contained options, which if exercised, will bring the total cumulative value of this contract to $296,281,243. Work will be performed in St Petersburg, Fla. (51 percent); St Aubin, France (32 percent); Ocala, Fla. (15 percent); Huntsville, Ala. (1 percent); and Alexandria, Va. (1 percent); and was expected to be completed by September 2005. This contract was competitively procured via the Internet, with three offers received. The Marine Corps Systems Command, Quantico, Va., is the contract activity (M67854-05-C-6014). In August 2006 Marines from 1st Battalion. 2nd Marine Regiment loaded Internally Transportable Vehicles onto an MV-22 "Osprey" and a CH-53E during test and evaluation exercises. This vehicle is designed to provide a deployed Marine Air/Ground Task Force with a ground vehicle that is transportable in the MV-22. Marine Tiltrotor Test and Evaluation Squadron 22 provided the "Osprey" for the exercises. The CH-53E was provided by Marine Heavy Helicopter Squadrons 461 and 464. Both squadrons made one of their helicopters available on separate days of the exercises. This is the first time they had been able to match the vehicle up with Marines and operational aircraft. It's an absolutely critical part of the development phase. The ITV has been tested for more than a year. The exercises gave Marines an opportunity to gain familiarity with the ITV, which is intended to be convenient for deployed Marines. Initial operational capability is scheduled for January 2007, when one infantry battalion receives eight ITVs.